The people of Tirbespyie have been establishing and developing co-operatives which have been very successful, socially, economically and agriculturally. There are 16 agricultural societies in Tirbespyie and Tel Hamiş, and they have about 600 members. The co-operatives have cultivated 17,000 dunams of agricultural land. 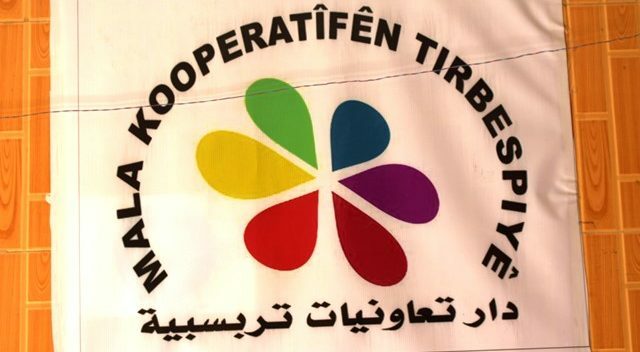 The success of the co-operatives extended to the surrounding villages of Tirbespyie. There were two livestock co-ops, including one in the village of Mizfat which has 14 members and three workers. Muhammed Amin, who is an administrator in the House of Co-operatives, said that the main goal of establishing co-operatives is to spread the culture of co-operation and co-existence among the peoples of the region, allow people to become self-reliant, and to curb the monopoly of some traders. Amin confirmed that the co-operatives have developed considerably in the last two years, despite the lack of rain in comparison to the previous year. Women participate and play the largest part, and master plans for future projects. The women in these co-operatives have the largest participation. Women pioneered in establishing and developing these co-operatives. The work of women started by establishing the Inanna Factory for making winter foods. Then many women started establishing agricultural co-operatives. Bahira pointed that the women in Tirbespyie played a leading role in establishing co-operatives, which were the main source of their income. In terms of future projects, Bahira said that they are working to open a women’s co-operative bakery in the village of Hilwa, and eleven women will be working to make it happen. Another co-operative project is a cleaning product factory in Tirbespyie. They are also planning to open a clothes shop in Mashoq, and a vegetable shop in Tal Marouf, both of which will be co-operatives that will have shares available.